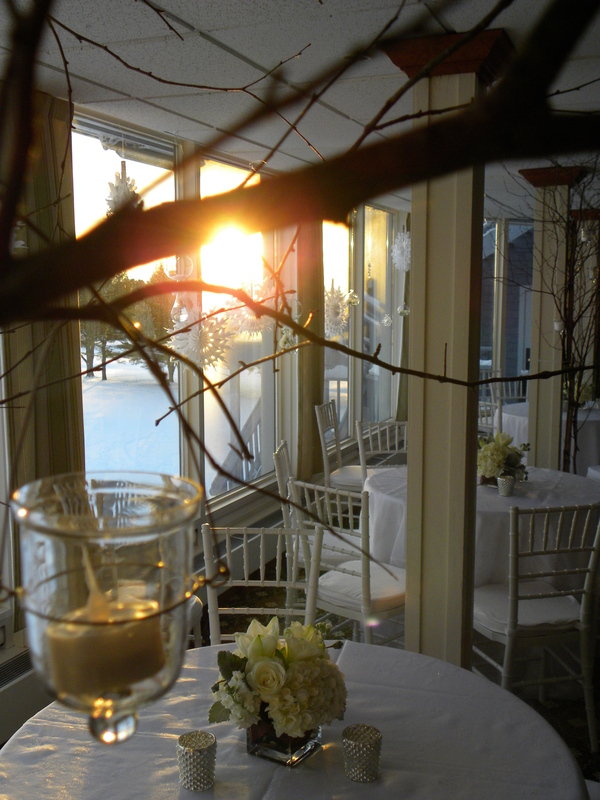 On New Year’s Eve I planned, decorated and executed a wonderful wedding. 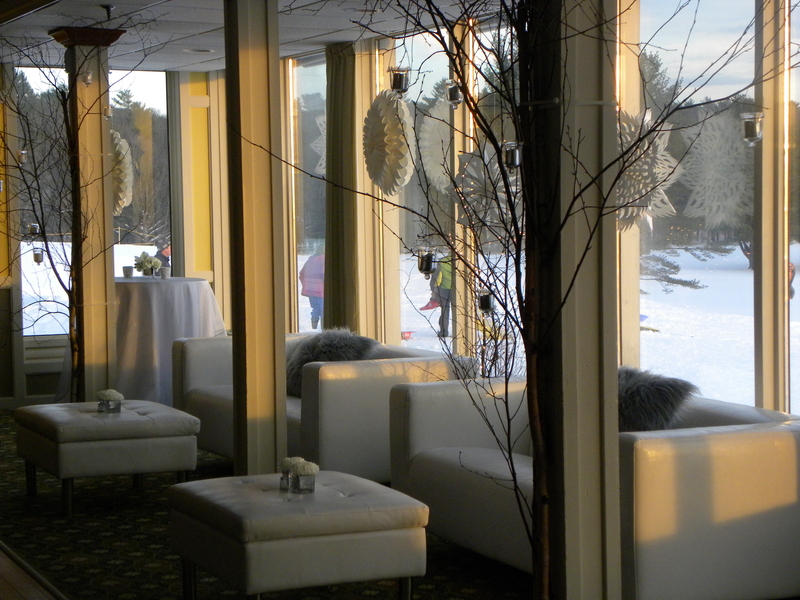 We had a white winter theme and it was truly magical. I would like to take all the credit but I had a very talented team working with me on this event. Carol Hiltebeitel of www.cocodesigncompany.com did an amazing job on the flowers and The Portland Country Club, our venue, did a fantastic job with the food and service. The Big City band (www.bigcityweddingband.com ) was rocking, and finally, the guests were lovely. 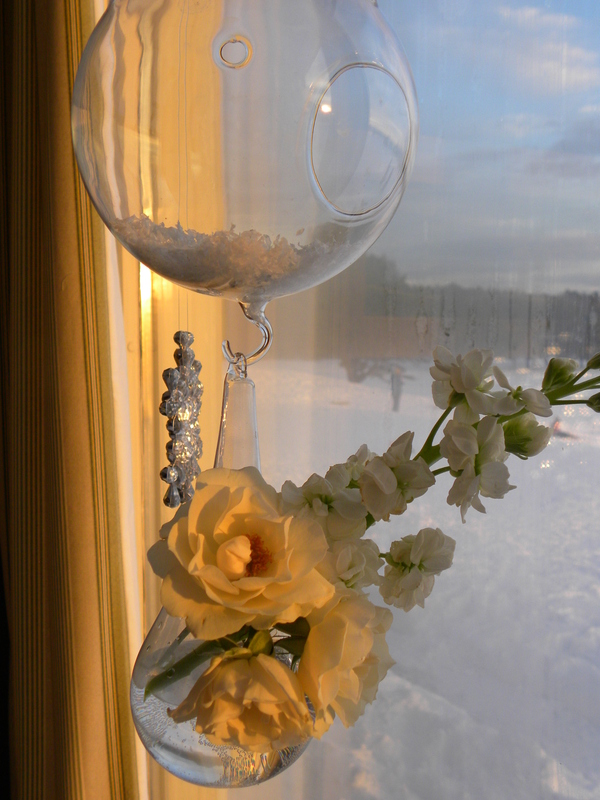 We hung these globes filled with flowers, fake snow and candles from the windows. 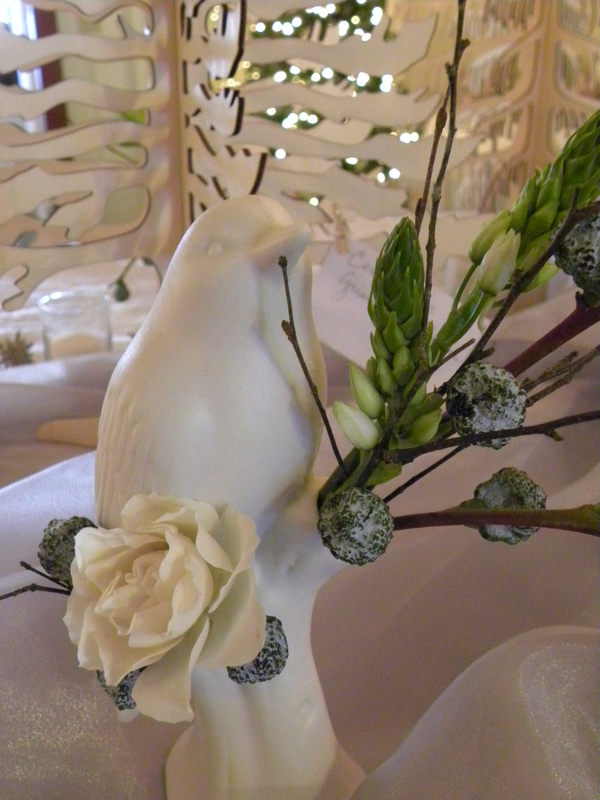 If you are a fan of Celia Bedilia you have seen my bird vases before. I love these vases and we used them to surround our charity tree. The bride and groom asked that guests donate to the Center for Grieving Children, in lieu of gifts. We created a table of branches, wooden trees and flowers to welcome the guests and remind them to donate to this wonderful cause. Carol did an incredible job with the flowers and plants. She planted mini cedar trees in my bark covered vases and created fabulous birch bark lined vessels for other mini trees. She is such a talent and I feel blessed to have her on my team. We rented the leather furniture from Minots www.minotts.com in Portland, ME. Thank you Sam! 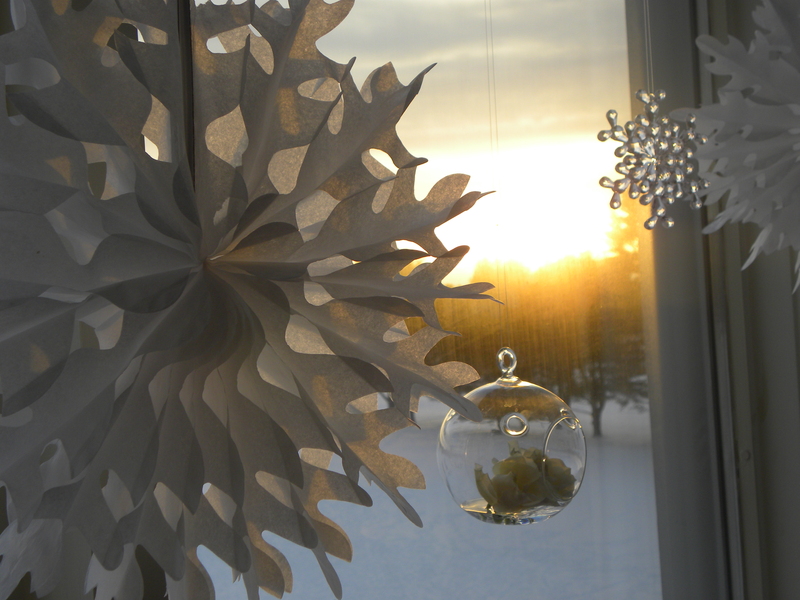 I ordered these fantastic snowflake lanterns (www.lunabazaar.com) which hung in the windows and the LED lights inside of them created such a lovely glow. 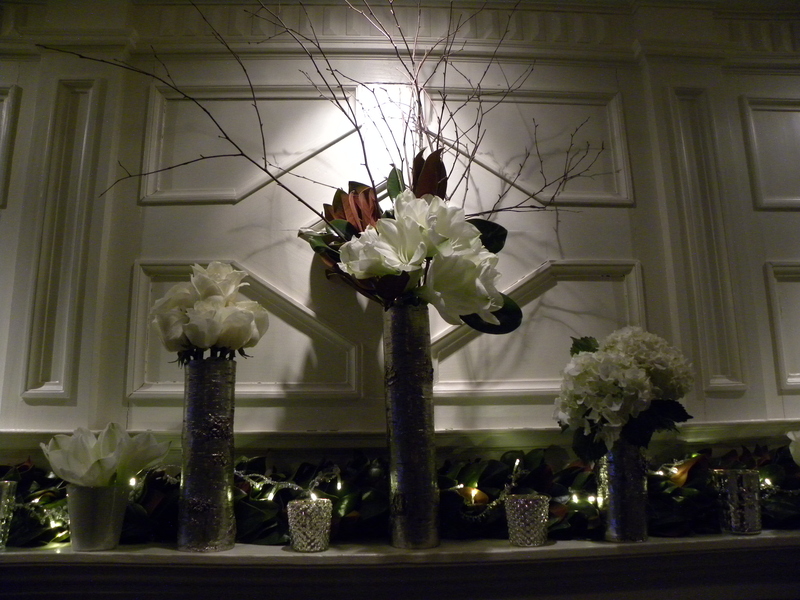 Mercury glass votives twinkled throughout the room…we had loads of candles and it was just beautiful. 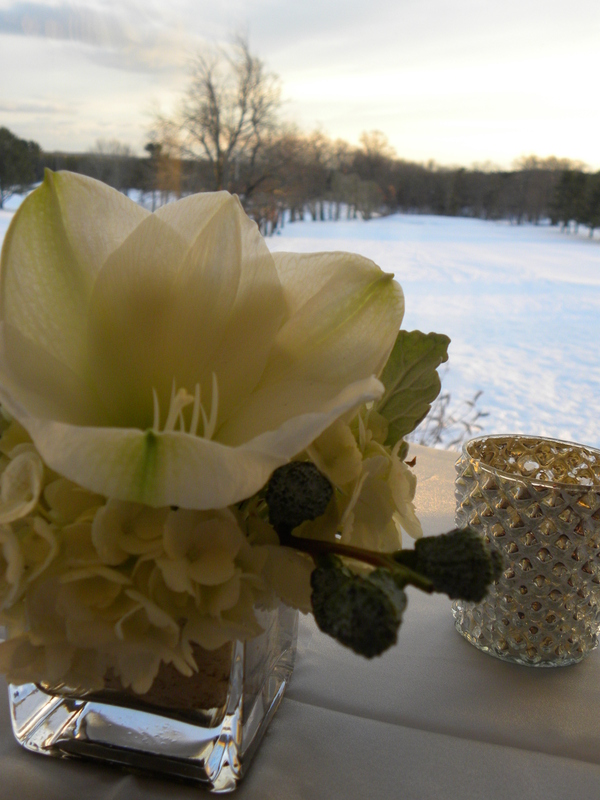 Carol combined Amaryllis, Dusty Miller, Roses and much more to make these fantastic arrangements. 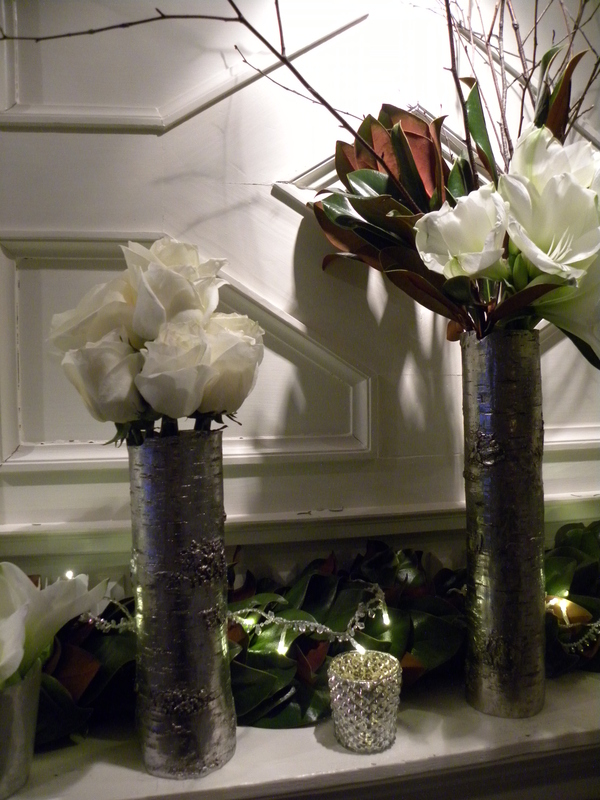 We wrapped the columns in birch branches, and hung votive candles from the branches. Fearful of fire hanging from branches suspended above the dining guests, we opted for battery powered votives. The chairs were rented from One Stop Party Shop. 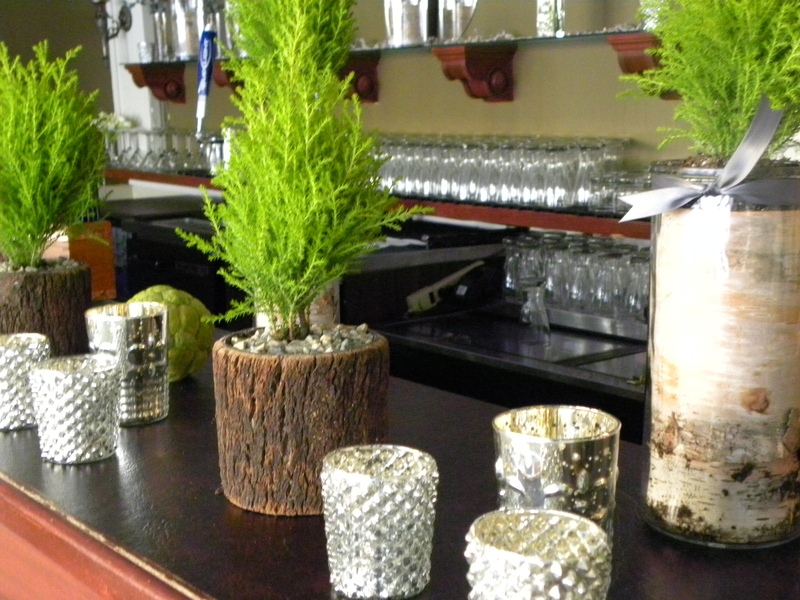 We also got this set of three silver birch vases from Home Remedies, Portland Maine. 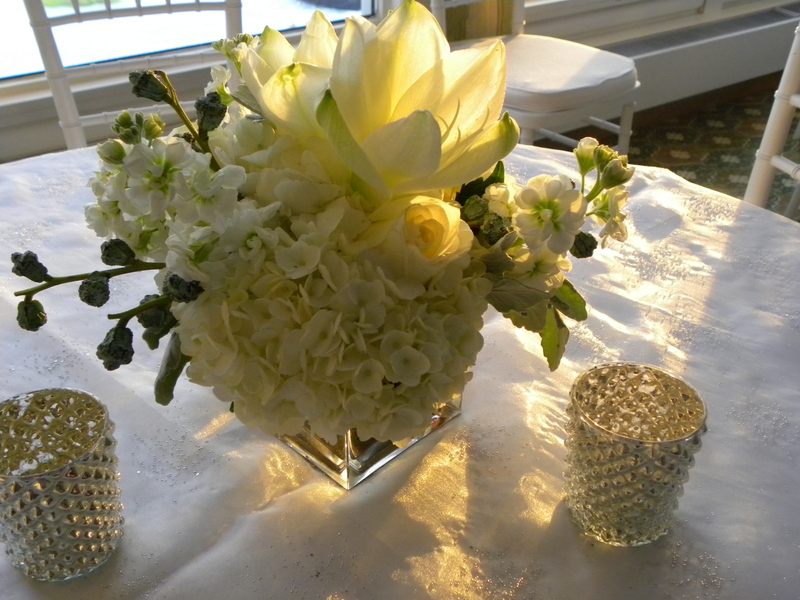 These arrangements were the centerpiece in the ceremony space. It was also the backdrop for the wedding photos. 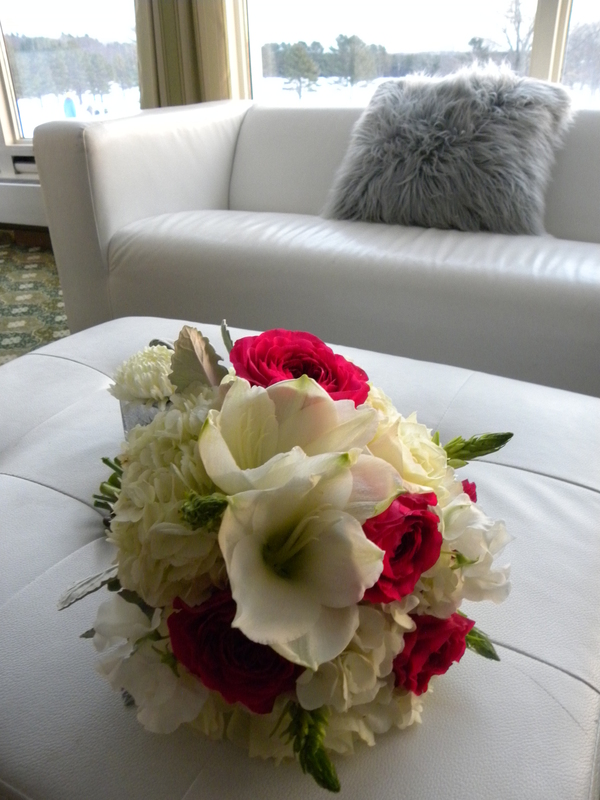 The bride loves hot pink so Carol added a pop of color to her bouquet…so romantic! This was a superb event, created by a team of professionals. Thank you all for helping me pull this off in just 4 weeks! 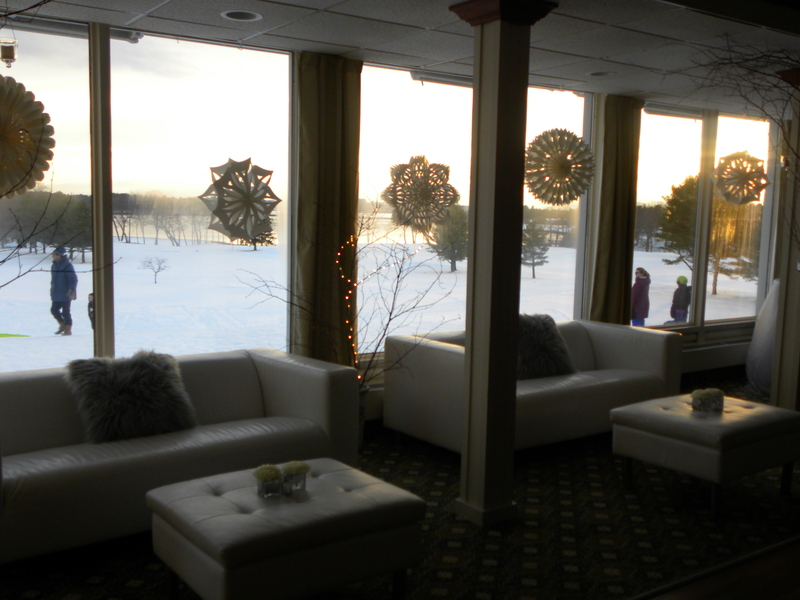 Special thanks to Ray-Ray, Jonny O’ & Kate (who came in on her vacation), & Alex who let us use the Clubroom. If you like this post let us know by liking it! If you have a comment for me, do not be shy…comment, and finally, PLEASE FOLLOW OUR BLOG BY ADDING YOUR NAME & EMAIL TO OUR LIST! We are nothing without you…Happy New Year. It looks fabulous Celia! You did an amazing job. I’m sure it was a magical setting. What creative ideas too- very talented!!! Could not do it without your great purchasing for Home Remedies! Like a breadth of fresh air! It all flows together so beautifully! Another job well done, Celia! OH THANK YOU. Happy New Year. Oh thank you! Yes you should renew your vows! Key West? Great pictures Celia! It was soo beautiful!